Pedro Santos Guimarães won the Minas Open 2008 with an average of 15.65 seconds. Carlos Alberto de Alcântara Jr finished second (18.85) and Renan Mondini Cerpe finished third (19.86). South American records: Pedro Santos Guimarães Rubik's Cube 14.56 (average), 4x4 1:25.81 (average), 5x5 2:29.25 (single) 2:42.73 (average), Rubik's Cube blindfolded 1:23.05, Rubik's Cube one-handed 20.61 (single) 25.44 (average), Megaminx 1:49.63 (single) 2:02.01 (average), Square-1 54.35 (average), Rubik's Cube multiple blindfolded 2/3 in 13:27, Leonardo Tambellini Rubik's Cube fewest moves 36. Johannes Laire won the Finnish Open 2008 with an average of 14.42 seconds. Anssi Vanhala finished second (15.01) and Mats Valk finished third (18.50). The Suwon Cube Championship 2008 will take place on August 15, 2008 in Suwon, Korea. Check out the Suwon 2008 website for more information and registration. The Shaastra Open 2008 will take place on October 4/5, 2008 in Chennai, India. Check out the Shaastra Open 2008 website for more information and registration. The Shanghai Open 2008 will take place on August 30, 2008 in Shanghai, China. Check out the Shanghai Open 2008 website for more information and registration. The Cincinnati Summer Open 2008 will take place on August 16, 2008 in Cincinnati, Ohio, USA. Check out the Cincinnati Summer Open 2008 website for more information and registration. Wen-Jia Jai won the Taiwan Summer Open 2008 with an average of 15.02 seconds. Hsuan Chang finished second (15.19) and Shih-Yao Lin finished third (15.53). Asian records: Han-Cyun Chen 4x4x4 Cube 57.40 (average), Wu-Cheng Lin 4x4x4 Cube 48.97 (single). Erik Akkersdijk won the Czech Open 2008 with an average of 11.55 seconds. Jean Pons finished second (11.99) and Rama Temmink finished third (12.28). World records: Erik Akkersdijk Rubik's Cube 7.08 (single). European records: Rama Temmink Rubik's Cube one-handed 20.02 (average). Dan Dzoan won the UCSD Summer competition 2008 with an average of 15.07 seconds. Ron van Bruchem finished second (15.24) and Leyan Lo finished third (16.65). North American records: Nick Young Square-1 16.59 (single) 23.55 (average). Asian records: Takao Hashimoto Square-1 25.92 (average). The Cube camp in Kanazawa 2008 will take place on August 22-24, 2008 in Kanazawa, Japan. Check out the Cube camp in Kanazawa 2008 website for more information and registration. Jan Jerome Bautista won the Philippines Open 2008 with an average of 14.94 seconds. JB Cañares finished second (15.10) and Mateus Moitinho de Almeida finished third (15.76). The Busan Cube Championship 2008 will take place on August 3, 2008 in Busan, Korea. Check out the Busan 2008 website for more information and registration. The Cheonan Cube Championship 2008 will take place on July 27, 2008 in Cheonan, Korea. Check out the Cheonan 2008 website for more information and registration. Jean Pons won the Toulouse Summer Open 2008 with an average of 13.57 seconds. Edouard Chambon finished second (13.70) and Benjamin Sintes finished third (15.99). Benjamin Sintes won the Italian Open 2008 with an average of 15.94 seconds. Lorenzo Vigani Poli finished second (17.40) and Lars Vandenbergh finished third (17.60). South American records: Rafael Werneck Cinoto 2x2 5.25 (single), Magic 1.93 (single) 2.05 (average). The Minas Open 2008 will take place on July 19/20, 2008 in Uberlândia, Minas Gerais, Brazil. Check out the Minas Open 2008 website for more information and registration. The Tokyo Open 2008 will take place on August 2, 2008 in Tokyo, Japan. Check out the Tokyo Open 2008 website for more information and registration. The Hong Kong Open 2008 will take place on July 27, 2008 in Hong Kong. Check out the Hong Kong Open 2008 website for more information and registration. The Czech Open 2008 will take place on July 12/13, 2008 in Pardubice, Czech Republic. Check out the Czech Open 2008 website for more information and registration. Phil Thomas won the Minnesota Open 2008 with an average of 14.32 seconds. Waris Ali finished second (17.55) and Alex Bailey finished third (17.92). North American records: Phil Thomas 2x2 3.90 (average). Ibrahim Vajgel-Shedid won the Vancouver Open Summer 2008 with an average of 15.47 seconds. Kristopher de Asis finished second (18.14) and Deseree Aune finished third (20.83). The Finnish Open 2008 will take place on July 19/20, 2008 in Helsinki, Finland. Check out the Finnish Open 2008 website for more information and registration. Jason Baum won the DaVinci Science Center competition 2008 with an average of 11.97 seconds. Mitchell Stern finished second (12.49) and Rowe Hessler finished third (14.39). World records: Dan Cohen 4x4 46.08 (single). North American records: Jason Baum Rubik's Cube 11.97 (average), Dan Cohen 4x4 56.54 (average), 5x5 1:38.40 (average), Pyraminx 5.59 (single), Clock 9.13 (single) 9.84 (average). The Taiwan Summer Open 2008 will take place on July 13, 2008 in Taipei, Taiwan. Check out the Taiwan Summer Open 2008 website for more information and registration. 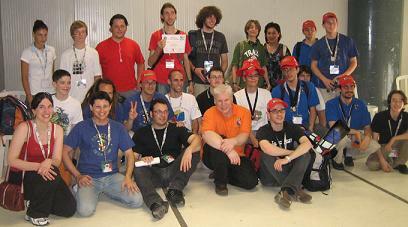 The UCSD Summer competition 2008 will take place on July 12, 2008 in La Jolla, California, USA. Check out the USCD Summer 2008 website for more information and registration.